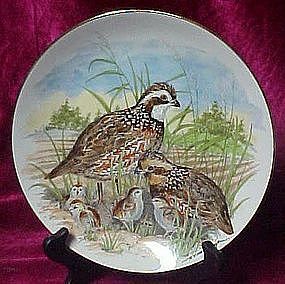 Bobwhite Quail plate by Southern Living Gallery. First plate in the Game Birds Of The South Series - 1982. Portrays a family of quail. Artist: A. J. Heritage. Size: 8½'' with real gold edge trim. Hand numbered,signed by the artist, and never displayed. Comes with a partial box, and certificate of authenticity.